Aboard the Maid of the Mist! Robby was up at the crack of dawn this morning in search of breakfast, windshield wiper fluid and a few other things on our list. Graham woke up and saw Robby stirring and immediately asked to go with him so by the time that he put on his clothes, Anderson noticed a boys trip about to happen and he was up and putting on his clothes too. So Robby and the boys left and Whitman tossed in bed with me for a few minutes before I started to wake everyone else up. I turned on the tv and soon all of my people were dressed and ready to go. Robby and the boys came back with doughnuts-including a nutella doughnut and we all sat and had our breakfast. They had hoped to go to the Walmart right across the street from our hotel but since today is Canada Day they were closed (a Walmart closed? That is just unheard of at home) At 8:15, we pulled out and met the Wilsons as they were pulling out to come and meet us. Our first mission today was the Maid of the Mist. This meant that we had to cross the border at the rainbow bridge and the crossing was relatively easy. I vividly remember when we would cross on our mission trips to Mexico and all of the grown ups with us would scare the mess out of us telling us to look ahead, hats off, sunglasses off. So now that fear is still in me and I am the one telling the kids to be still and be quiet. Campbell, though, is terrified of any police (remember the Ford home incident yesterday) that she is the quietest and stillest the entire time..wish that would continue during the rest of our drives. We drove right to the Niagara Falls State Park and parked at the front of the parking lot and then Robby and Tony were at the ticket window before it even opened. They bought our tickets for the morning and then we headed off on a 10 minute walk to ride the Maid of the Mist boat. Since Campbell had talked about Annie Edson Taylor for her oral report (click here for that video (36 seconds into video), I believe that Graham somehow believed that we were going over the falls too. He had already told me that he didn't want to go on the boat ride and was a bit nervous. Keaton had asked a zillion times about going over the falls so I knew that she didn't understand that this boat ride wasn't like the roaring rapid ride at Silver Dollar City. Most of the morning I have wondered what Keaton and Whitman were thinking and how much they understood about what was happening-especially Whitman. Usually we try to stay out of the water but today we were shoving those babies towards water. 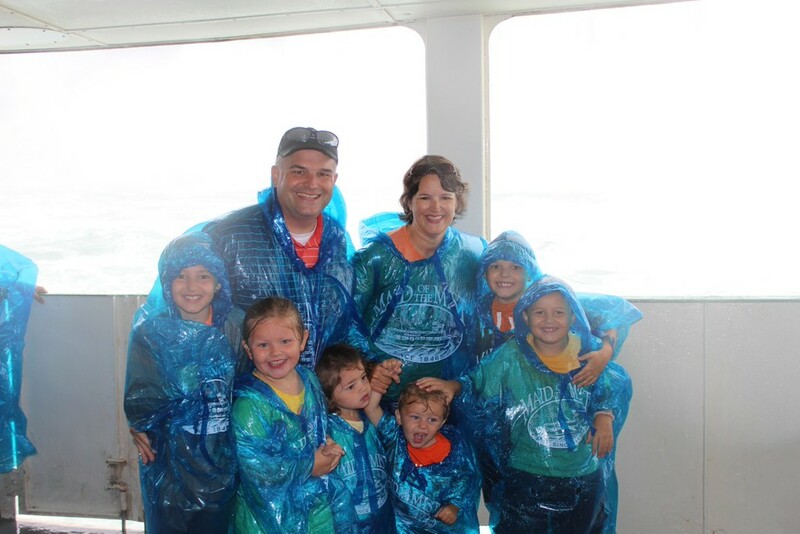 They have had ponchos over them, on a rocking boat with Campbell and Reagan squealing, water pouring over their feet and have been shouted at while we are yelling over the roar of Niagara Falls. (And tonight up close to the loud and bright fireworks.) Thankfully, Whitman has handled everything very well and didn't have any meltdowns today!...well, I probably should say that he hasn't had many meltdowns today-he is 2 after all. Back to the Maid of the Mist: The crowds were not too bad and after going down the elevator to the boat dock, we shuffled right on and found our spot on the top deck. Everyone put on their ponchos and soon the boat was moving. This was my 3rd time on the Maid of the Mist but my first time to ride on the top. I now understand why we have never gone to the top before. The mist starts out gently falling as we snapped our pictures nearing the American and Bridal Veil Falls. Then it gradually gets heavier as we approach Horseshoe Falls. And then the next thing you know you are in the middle of a wind storm on a rocking boat and it is pouring on your head. Whitman was shouting "rain, rain" and Robby and I were doing the best we could to have a hand on Whitman or Keaton at all time and take pictures of everything else that was happening. Pure craziness-and it was awesome. After the boat docked and we took off our ponchos, we took the elevator up to the overlook and over looked. Then we walked back to where we had started the morning and got in line for Cave of the Winds. Robby and I have done this forever ago but this time, they provided you with these snazzy shoes to wear (velcro sandals). If you are wondering what they look like, then you will just have to wait until Christmas to see because one will be hanging on my Christmas tree. Even Whitman had on the little shoes and they matched his little poncho perfectly! When we finished the walk, everyone was pretty soaked but thankfully the ponchos did their job and no one had to change their clothes. We walked to the back of the parking lot to have our picnic. On the way, Tony and Robby moved the cars and as we were about half way to the picnic spot, Shannon asked "where's Campbell?" Well, I had no idea becuase all I knew that I heard was Robby telling someone that everyone was going with me. I told Shannon to go on and I booked it back up the sidewalk trying to remember when I had even seen Campbell last. I mean really, I do have 6 kids! Ha! I kept thinking that maybe she was with Robby and he saw me flail my arms trying to get his attention and knew something was wrong. It was too far to shout so I just held up a letter C and he started pointing that to himself. He then turned closer and shouted that she was with him and my heart was able to start beating again. Robby said that he had told me she was with him but I sure never heard and now my life is shortened by a few years! Lunch was perfect-we at the state park in the New York side of the falls. We made our lunches while the kids all played football and frisbee. Then everyone ate and played some more. It was a nice leisurely lunch. The New York side of the falls is mainly a state park but the Canadian side is more developed and touristy (Vegas-esque)...and I like them both! After lunch, we ran to the grocery store to pick up our necessities. Les had sent us some ice cream suggestions to hit while on our trip and since we have only been to 2 so far, I was feeling bad that he had done all that work and we hadn't taken full advantage of it so today, we went to two more ice cream spots (bringing our total ice cream stops to 6). This ice cream place overlooked the Niagara River in Lewiston. The Man vs. Food man had been here and eaten a haystack sandwich so Tony and Robby split some of that (even though we had just come from our picnic). Then onto the ice cream-they had a Silo Sand Dock Sundae Challenge which decided to try. It was 9 scoops of ice cream, oreos, hot fudge and gummy warms. You were able to pick your types of ice cream so soon our bucket full of almost a gallon of ice cream was served. It was really good and of course, we finished it off rather quickly. I asked the workers if they would wash the bucket out for me so I wouldn't mess up their bathroom sink and they said sure. Then she asked what size tshirt I would like. I had seen a sign about finishing the ice cream and getting a tshirt but told that we all ate the ice cream and not just one person. She said that was fine and we could still have one tshirt. The kids were so excited that they started picking which day they will wear the tshirt. The ice cream stop was picture perfect (had we had a working camera) and we hung out there watching the river and speed boats below before loading up. Before we crossed back into Canada, we thought we might shoudl stop at one more of Les' ice cream stops. This one was called Twist of the MIst and was built in the shape of an ice cream cone. Robby decided that he did not get to eat adequate amounts of our ice cream in a sand bucket that we had just eaten so he ordered a flavor he wanted to try called "fireball." He liked the flavor but it just melted so fast that he had ice cream running down his arm by the time he finished. We then crossed back over to Cananda and drove along the water front for a few miles. We stopped at the Spanish Aero Car to watch it and then we stopped at a gift shop just so we could take some pictures. Then it was on to the hotel-we are staying at a Holiday Inn right near the falls. The rooms are fine and we unloaded for a bit before leaving again. Our evening adventures included a walk through the Clifton HIll area. The Wilsons ate at Hard Rock Cafe and we opted for Tim Hortons. The place was crazy-like line out the door crazy. All of the kids had grilled cheese paninis except Reagan who had a chicken and cheese panini like me. Everyone must have been hungry because they ate all of their food and after it was over, we walked back down the main street. This place was happening tonight-maybe it always is, maybe it was because of the fireworks, maye it was because today is Canada day but the street and crowds were crazy-if I said "hold on to the stroller" once, then I said it a hundred times. We had told the Wilsons to meet us at 9:45 before the fireworks if they were finished eating and sure enough they showed up. Shannon said that she was glad we all had on the same color (today is yellow and orange day) because it made it a lot easier to spot us. The walk back to the hotel was like leaving Riverfest after fireworks or walking in Race for the Cure. We shuffled back up the steep hill to our hotel-when we arrived Keaton was sound asleep, the others started changing and laying down and Whitman played his trains until bedtime. He even fit in the bathroom-miracles never cease.